Banner advertisements eating your web page loading time? Take a look at this post. 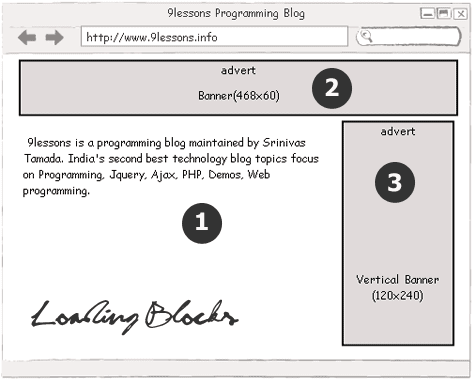 how to display advertisiment blocks after loading the main content block with jquery. It is very simple ajax implementation with jquery. Use it increase your web project loading speed. //Side banner funtion same like topbanner. Nice articles... could you please add some indentation to your code samples? Thanks! You may want to add <noscipt> with the HTML embed for the ad for old browsers or browsers with JS disabled for compatibility. Working fast loading on the web fast & execute fast. It's useful for managing site loading time. Thanks. it's good to show our own images but when you tried to load google adsense it wont..
Nice, but there is a downside with this approach. Banners can't communicate with each other. So it is not possible to show only banners for brand X. So block a competitor. Useful.. you can always load one originally and replace it after only if js is enabled. No need for noscript.